Errachidia, Morocco - The last time a South African piloted Navara conquered the dunes of Merzouga was when Giniel de Villiers charged the sand monsters during the 2005 Dakar Rally in his locally built Nissan off-road special. As member of the high-profile Nissan Rally Raid Team, the South African and his Belgian co-driver Jean-Marie Lurquin completed this stage in third position overall, and then went on to finish the race fourth overall in his racing Navara - the best ever Dakar placing for the Nissan team. Over the past weekend (November 12, 2016) some South Africans again had the opportunity to tackle the Dakar dunes - in the latest incarnation of the Navara, earmarked for local launch early next year. The first, and most important, is an increase in ride height. This will make the local models unique (at least initially) as SA will be the first to receive this derivative. Whilst the Euro-spec models’ ride height is indicated as 228mm, the SA Hi-Rider models will have around 20mm more clearance. This also means further changes to the spring and damper ratings, while an electronic rear differential will be standard in the top models. However, the King Cab version - the model that started the double cab craze - will not be made available here. Furthermore, the polyurethane load bay cover used in the Euro spec model will not be used in SA and last, but not least, all Navaras will locally be retailed with a class-leading six-year or 160 000km manufacturer warranty. Combining the best of its more than 80 years of experience in designing and manufacturing robust and cleverly engineered pickups, Nissan designed an all-new five-link rear suspension system for the new D23 model Double Cab. Not only is this setup with coil springs 20kg lighter than the previous leaf spring layout, it also provides for more rigidity, enhancing ride comfort and improving handling on and off-road. On the Moroccan tar roads the Spanish-built unlaided Navaras, their 18" tyres pumped to 2.4bar, still felt stiffly sprung and hard, but its reaction was lively and more pro-active than is the norm in this class. But on undulated dirt roads it came into its own, affording the Navara with good ride quality, and the higher the speed, the better. In the Merzouga dunes the Navara proved quite formidable. Its good wheel articulation and soft rebound at the rear made it less prone to bouncing, and therefore more predictable and easier to drive. The ‘shift-on-the-fly’ four-wheel drive system delivered sure-footed traction over the rough terrain, and its seven-speed auto ’box, while sometimes jerky in low-range, was smooth on the open road. Its low ride height did cause it to scrape over some of the higher sand steps, but with the increased ground clearance of the SA models this should not be a problem. While the single-turbo derivative of Renault-Nissan’s 2.3-litre dCi diesel engine (120kW/403Nm) will be used in the leaf sprung single cab models, the double cab versions are fitted with the 140kW Euro 6 complaint twin-turbo variation with 450Nm of torque. 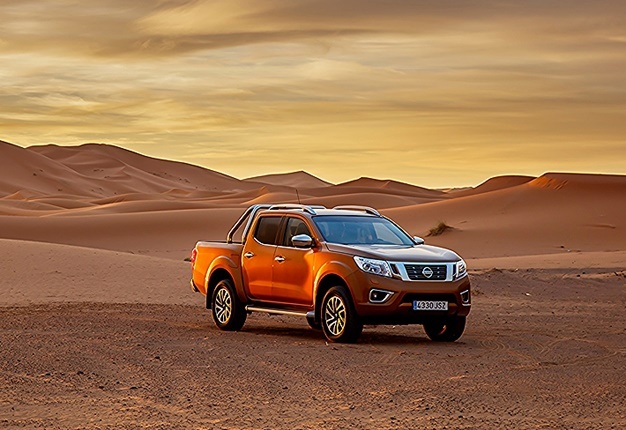 The engines are quiet and refined with CO2 emissions starting from as low as 159g/km, which makes the Navara best in its class in this respect. Fuel consumption, according to Nissan, is 6.4-litres/100km in the combined cycle. 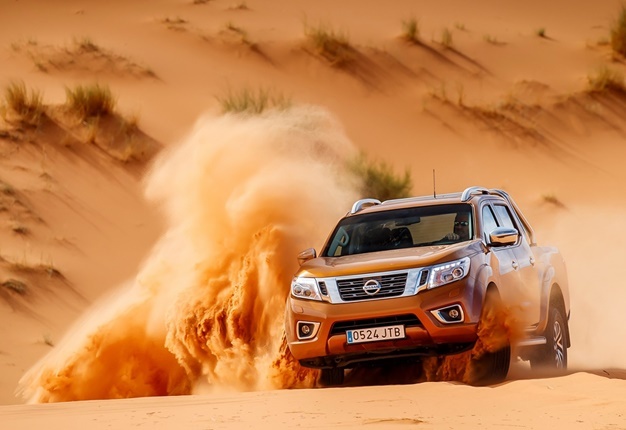 While its GVW has increased by 25-35kg and kerb weight by 5-38kg (both depending on model), the Navara’s 0-100km/h time is still 10.8 seconds and its top speed 184km/h. Payload ratings are in excess of one tonne across the range and its towing capacity is 3500kg, while the double cab’s load bed is 67mm longer than its predecessors’. The interior is well-designed, ergonomically sound and quite spacious, also at the back. Some of the dashboard materials are hard in comparison to its competitors, but features such as dual-zone digital climate control and rear cab ventilation provide for a comfortable environment. According to Gobille the new Navara will be launched locally early next year, with initial batches sourced from Thailand before production in Rosslyn is ramped up. At the outset the range will consist of 2.3-litre turbodiesel models in double cab and single cab format, with 4x4 or 4x2 drivetrains and seven-speed auto or six-speed manual transmissions. 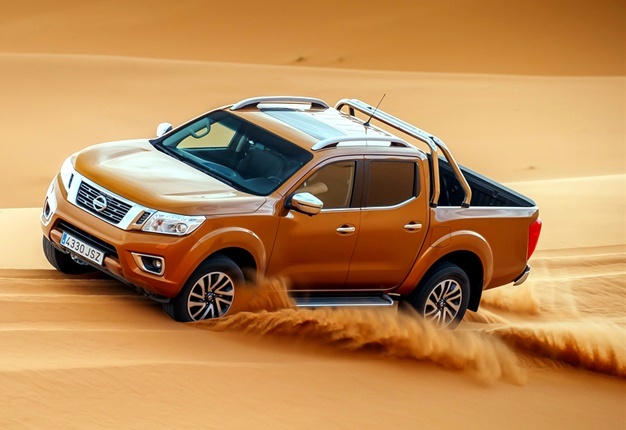 Petrol driven derivatives, powered by the same 2,5-litre unit used in the X-Trail, will later be added, and the Navara, together with the older generation D40 NP300, will be exported to markets in Africa. Gobille did not want to elaborate on pricing, saying this will be announced at launch, but did indicate it will be competitive, given the high spec level and class leading service plan that it will offer. 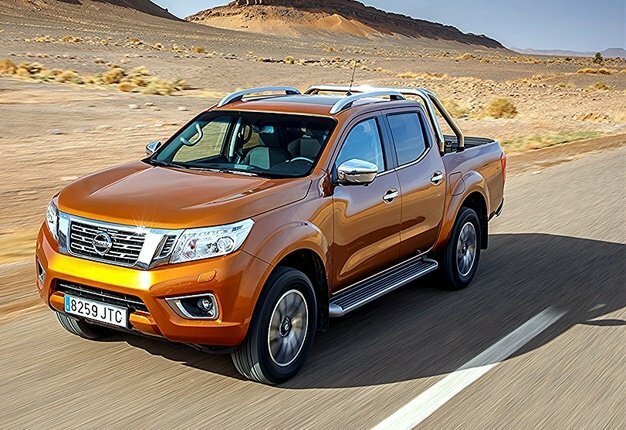 Judging by our first impressions the new Navara is quite impressive in terms of performance, safety, technology, comfort and convenience, and with its good ride quality and sure-footed handling deserves to be considered by those interested in a new double cab. Toyota Gazoo Racing South Africa announced the teams that would be representing Toyota SA’s Motorsport effort in the off-road racing series for 2018.